Think back to last winter,to the cold, dreary, sunlight starved days. We’ve spent our winters skiing, snowboarding, sitting on the couch drinking beer and eating nachos or, dare I say riding the trainer. Not to say that these activities aren’t fun except maybe riding the trainer but, really nothing compares to the joy of riding your bike. There has been much debate as to where fat bikes started Minnesota, Alaska, The Southwest. Wherever they started, and whoever concocted the idea for a wild mountain bike that can traverse snow, they have changed the cycling landscape and opened up new adventures to be had. Starting as just a “fad” from a few rebellious bike companies the idea of a fat bike has hit the mainstream with every major brand including a fat bike in their line up. I can remember the first Pugsley I rode in Burlington put together by a fellow mechanic. We all rode it and thought it was so cool but I couldn’t justify needing a monster truck of a bike. it would be another 4 years until I pulled the trigger and got one myself. After one ride I knew it had been a mistake to wait that long. Riding a fat bike brings back the smiles and joy of first riding a bike as a kid, the feeling of freedom and the ability to explore the world. Even riding the same trails you ride in the summer is an entirely different experience when they are covered in snow. 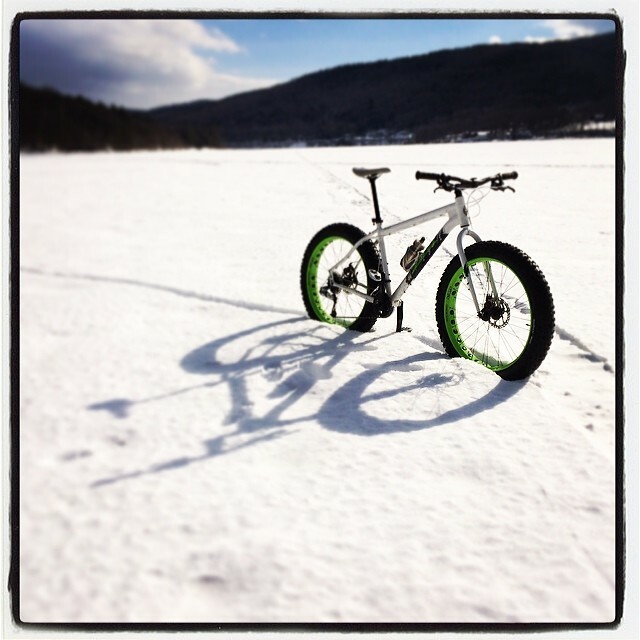 A fat bike enables us to chase an endless summer in the snow.